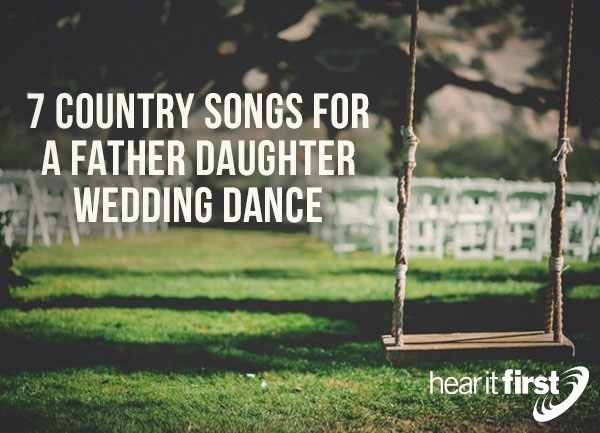 Here are seven great country songs for a father-daughter wedding dance. Butterfly Kisses, by the Raybon Brothers, seems to be written by a loving father who says there are “two things I know for sure. She was sent here from Heaven and she's Daddy's little girl,” and “As I drop to my knees by her bed at night. She talks to Jesus and I close my eyes” and I “thank God for all of the joy in my life” but “most of all…For butterfly kisses after bedtime prayer.” What precious memories of a father for his now grownup daughter, but still remembers her, “Sticking little white flowers all up in her hair,” as she says, “Walk beside the pony, Daddy, it's my first ride.” These precious memories of a father about his daughter make this a perfect song for the father-daughter dance. There may not be a dry eye left in the place. Daddy’s Hands, by Holly Dunn, is an older song, but certain things don’t diminish with time. Some things never change, like a daughter’s love for her father and a father’s love for his daughter. Now that my children are all grown, this song has special meaning, particularly to my son, because he remembers hearing this song when he was young, and today, it brings back fond memories of his childhood, and hopefully of his daddy. How many of us in the older generation can “remember Daddy´s hands, folded silently in prayer. And reaching out to hold me, when I had a nightmare,” and seeing those hands, “You could read quite a story, in the callouses and lines,” because “Years of work and worry had left their mark behind.” Even so, “Daddy's hands were soft and kind when I was cryin´. Daddy´s hands, were hard as steel when I´d done wrong. Daddy´s hands, weren´t always gentle. But I´ve come to understand. There was always love in Daddy´s hands.” She even remembers, “Daddy´s hands, working 'til they bled,” but hands that could tenderly hold her and show his love for her. What a great song for a father-daughter wedding dance. Ricky Skaggs’ song, Thanks Again, was a beautiful tribute to his parents so he must have had a good relationship with them. It’s easy to see how much he treasured his parents when he sings thanks to them “for takin’ me fishin’ and flyin’ my kites. And tuckin’ me in, yes, night after night,” do “To my beautiful lifelong friends, hey Mom and Daddy thanks again.” Everyone may not like country music, but the daughter given in marriage may be able to identify very closely with these words, and what father wouldn’t love to dance with his beautiful bride daughter on the day she’s given away. This very simple acoustical song will tug at the heart strings of every parent and child, and that’s as it should be on this very special occasion. My Wish, sung by Rascal Flatts, contain lyrics that are sure to touch the heart of a father and daughter. This song seems to be about a father finally “letting go,” and what father hasn’t thought about the day when she leaves? Even at the birth of their daughter, fathers are preparing for that big day when they have to let their daughter go free, especially on the day of her wedding. As a reminder of his love, they sing, “While you’re out there gettin' where you’re gettin' to. I hope you know somebody loves you.” What greater wish for a father than to have his precious daughter be cherished, loved, and cared for as he did during his life? This is why this song makes our list of one of the best father-daughter wedding songs, even though it could fit any number of occasions in life. I Hope You Dance, by Lee Ann Womack, soared up the country charts in 2000, and on the way up, touched the hearts of millions. It immediately became popular at weddings because it makes a great backdrop for a father-daughter wedding dance. Lyrics include, “I hope you still feel small when you stand beside the ocean. Whenever one door closes I hope one more opens. Promise me that you'll give faith a fighting chance. And when you get the choice to sit it out or dance,” so this song points backward at life, but also forward. At such monumental events like weddings, we often take a look back, while still looking forward, so when it’s time for the father-daughter dance, this treasured song will create precious memories that will last a lifetime. Kippi Brannon’s Daddy’s Little Girl, is a song about a father that reminisces about his young daughter’s childhood. Gone are all the “mud pies” and “tea parties” and dancing with daddy, singing, “Daddy take me with you. I promise I'll be good. Daddy, it's next time. And Mama said I could,” however this song seems to be written specifically for a father giving his daughter away in marriage, because she sings about, “Walking down the isle. My eyes on Mr. Right. My bouquet was shaking. But Daddy held on tight,” and as “He gave me away 'cause I couldn't stay. Daddy's little girl.” This father is a Christian dad because the daughter says her father “taught me my bible. From seven to thirteen. Taught me to drive when I was a wild thing. I reached and he prayed when I made some mistakes. That I wouldn't have made if. I'd've done it his way.” Kippi Brannon wrote the perfect song for a wedding ceremony as the father walks his daughter down the aisle, giving her away, but also makes for a beautiful father-daughter wedding dance. The song, I Loved Her First, by Heartland, is a stirring song about a father who loved his daughter first, before her husband ever met her, and he expects his son-in-law to love her too! You get the imagery of a father watching his precious daughter dance at the wedding reception with her new husband and in reflecting on this, he thinks, “Look at the two of you dancing that way. Lost in the moment and each other’s face. So much in love your alone in this place. Like there's nobody else in the world,” and as if he’s singing to the groom, he says “she still means the world to me. Just so you know…I loved her first and I held her first. And a place in my heart will always be hers.” This makes the best song that I can think of for a father-daughter wedding dance. A wedding is one of the most special of all occasions because it’s such a monumental event in a person’s life. Not just in the son or daughter who’s getting married, but also for the mother and father. Now, as a parent, I can see why they cry at weddings and why these songs have such great meaning for both the father and daughter. If you can think of another song that would be great for a father-daughter wedding dance, please feel free to suggest it.